Montserrat College of Art announces a new documentary film course in Montreal this November, open to adults, undergraduates, and professionals in the film industry. 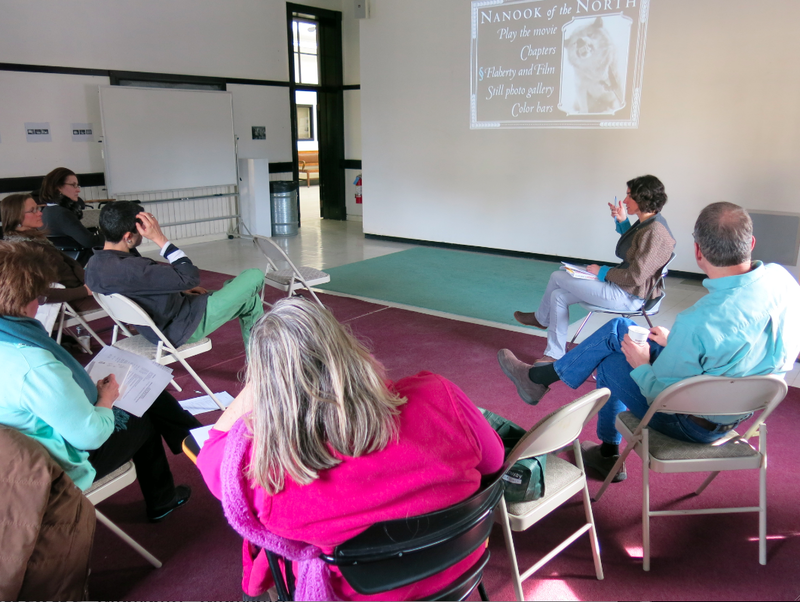 Those of you who maxed out your Salem Film Fest (SFF) festival pass earlier this year may have noticed a dozen or so adults who took in the festival as part of a new class offered by Montserrat College of Art’s Continuing Education Department. The participants met on Montserrat’s campus a week prior to the festival for a day of exposure to the history and form of documentary, plus a discussion about how to access documentary films for use in community settings. On festival Saturday, the group saw two movies together as well as a panel, hashing over the experiences as a group periodically throughout the day. It was definitely a doc-savvy bunch and we had thoughtful discussions that scratched beyond the surface of SFF’s always challenging line-up. Positive feedback from the participants has turned into a plan for the class to return to SFF in 2015, with an expanded partnership between SFF and Montserrat Continuing Education. Stay tuned for details! But if you need to whet your documentary film whistles in the meanwhile, a similar kind of class, also offered through Montserrat, will be traveling to Montreal in November for the prestigious Rencontres internationales du documentaire de Montréal (RIDM) film festival. If you’re not familiar with RIDM, it’s also documentary-only and known for its cutting-edge programming with a focus on both Canadian and international nonfiction cinema. Just as with SFF, documentary film lovers, undergraduate and adult education students, and film professionals are strongly encouraged to attend. In addition to moviegoing at the festival, site visits to landmarks like the National Film Board of Canada and local faculty lectures designed to immerse participants in Quebecois cinema, past and present, are also in store. Registration is now open and there are many options—you can opt for three or five days of class (November 13-17, 2014), choose to stay with a local friend, or at a four-star hotel. Tuition ranges from $400 to $1,100 and includes film festival and public transit passes and can also include undergraduate credit. For guaranteed housing, participants must register by September 28. The instructor for this class, too, is (moi), Erin Trahan, a frequent SFF jury member, local film journalist, and co-author of five Frommer’s travel guides to Montreal and Quebec City. In addition to planning events that will educate participants on the province’s film industry, I’ll offer one-on-one recommendations to the Montreal’s unique culinary and cultural destinations. So if you haven’t tasted a Montreal bagel or those exotic fries covered in gravy (aka poutine), there will be chances for that, too. SFF has joined us as a partner on this class and we want to extend an especially warm welcome to you as an SFF supporter. You know your stuff! So please, strongly consider taking a long weekend in Montreal this November and spread the word to whomever you can. For more info and to register, visit: http://montserrat.edu/continuing-ed/ or contact the Continuing Education department by email at ce@montserrat.edu or by phone at 978.921.4242 x 1202.